Qualifications: BSc in Biology from Imperial College London – Upper-second class honours. 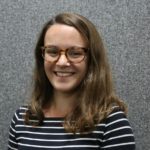 As an undergraduate, Rebecca undertook a sandwich year at therapeutic antibody company Kymab Ltd. in Cambridge, where she continued working for two years after graduating. Here she became experienced in high-throughput PCR, embryonic stem cell culture and DNA modification. Rebecca joined the UCL-Birkbeck MRC Doctoral Training Programme in 2017. Her research is focused on finding the ideal cell for peripheral nerve repair in the EngNT system, using a combination of tissue and cell engineering.